Last Updated: March 23, 2018 | Subscribe to our weekly newsletter! Want to know a secret? Typical sanitizer levels are no match for algae in your pool. On a sunny day, algae photosynthesize and multiply rapidly, growing your microscopic problem into a pool-sized one in no time. It’s easy to ignore a little cloudiness or some stubborn, dark debris by your stairs, especially when your pool is getting heavy use. But overlook algae for just a little too long, and you’ll wind up spending a lot of time and money to get rid of it. Before that slimy nuisance grows out of control, get rid of pool algae with a special deep cleaning procedure. Then make sure it never comes back by using smart prevention measures. Even if you don’t have lily pads floating on your pool’s surface, you could still have a plant problem. Algae gets into your water in a number of ways, such as microscopic particles on someone’s swimsuit or a little patch of slime on a pool float. However it’s introduced, you’ll want to get rid of it as quickly as possible. If you fail to maintain balanced water chemistry, you might as well formally invite your algae to make itself at home in your pool and stay forever. Unlike the harmful algae blooms found in marine waters, none of the three types of pool algae are harmful to swimmers. But algae in your pool can cause cloudiness so thick you wouldn’t be able to see a struggling swimmer underwater. They also provide food for some types of bacteria you don’t want in your pool. Plus, slimy pool water is just uninviting, to say the least. Algae’s most noticeable symptom is discolored pool water. Depending on the type of algae infecting your pool, the water may be greenish, yellowish, or even blue-black. Gross, right? Another telltale sign is residue in any of those colors around stairs, in corners, on pool walls, and around jets and skimmers. Algae loves to grow in nooks and crannies where you may not see it until it’s too late. The exact tint of your water might not be so obvious, plus it’ll be cloudy, so it may be difficult to tell which kind of algae has take up residence in your pool. To be sure which type of algae is in your pool—which will determine how you get rid of it—take a close look at any spots where algae is starting to grow. Green algae: The most common and easiest algae problem to kill is chlorophyta, which gets its color from chlorophyll. Green algae floats in the water, making it cloudy and giving it a greenish tinge. Slimy green algae also attaches itself to your pool walls and floor. Poor filtration and lack of proper sanitization boost green algae growth. It can be introduced to your pool by swimwear and toys that have been used in natural bodies of water that contain algae. Yellow algae: If you see what looks like pollen or sand in a shady corner of your pool, you probably have yellow algae. It’s also sometimes called brown or mustard algae. It’s rare, and not slimy like green algae. It’s also chlorine-resistant, which makes it tough to treat, whatever name you call it—even the four-letter names. Black algae: Technically a cyanobacteria—not algae at all—this nasty offender makes its own food, so it grows and grows. Not only that, its roots dig into concrete surfaces, making it tough to kill black algae. It’ll grow back quickly if your treatment isn’t aggressive enough to ensure none of the roots hang around. Note: Pink slime is another bacteria that grows in pools, especially inside polyvinyl chloride (PVC) pipes. It’s sometimes called pink algae, but that’s a misnomer. You can get rid of pink slime in your pool, but it’ll take some hard work. You can at least rest assured that pink slime isn’t harmful to humans. We can’t say the same for your pool, though. Send That Pool Algae Packin’! The best method for clearing up your water is the same for all three types of algae with just one exception— pool shock If you click this link and make a purchase, we earn a commission at no additional cost to you. . More resistant types of algae require more aggressive treatment, so you’ll need more shock. Automatic or robotic pool cleaners aren’t well suited to cleaning algae. 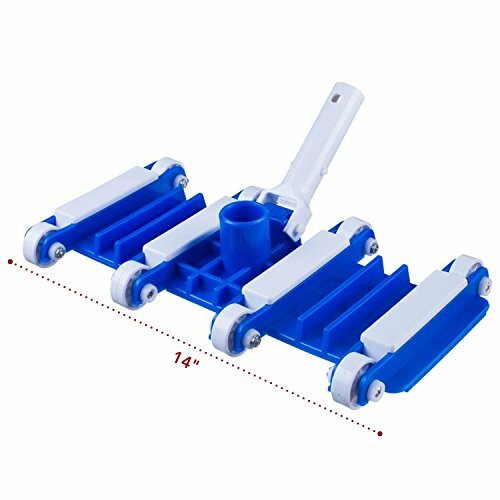 Ideally, you’ll manually vacuum directly to waste, bypassing your filter and preventing recirculation of your contaminated water. When you vacuum your pool manually, pay special attention to areas with algae. Scrubbing the algae off your pool walls lets your sanitizer get deeper into the remaining algae. It also stirs up the sediment you’ve brushed off so it can be killed and filtered out. 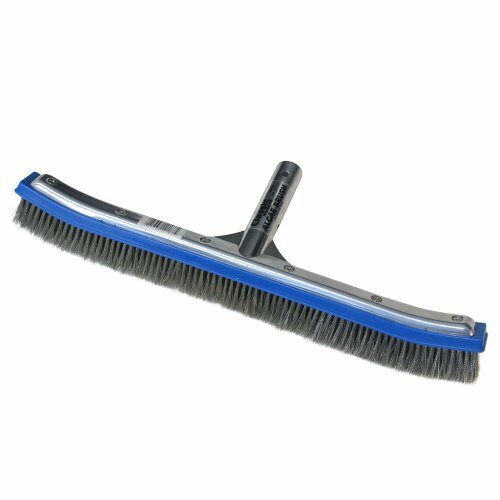 Using a stiff pool brush If you click this link and make a purchase, we earn a commission at no additional cost to you. on a pole, brush the walls and floor of your pool. Pay special attention to corners and shady areas where algae is usually worst. As you go, your water will become cloudy, obstructing your view, so get those tough spots first. Use your test strips If you click this link and make a purchase, we earn a commission at no additional cost to you. , digital kit If you click this link and make a purchase, we earn a commission at no additional cost to you. , or liquid kit If you click this link and make a purchase, we earn a commission at no additional cost to you. to test your alkalinity and pH. Balancing your water chemistry now, ensures your sanitizer will be effective against the algae. 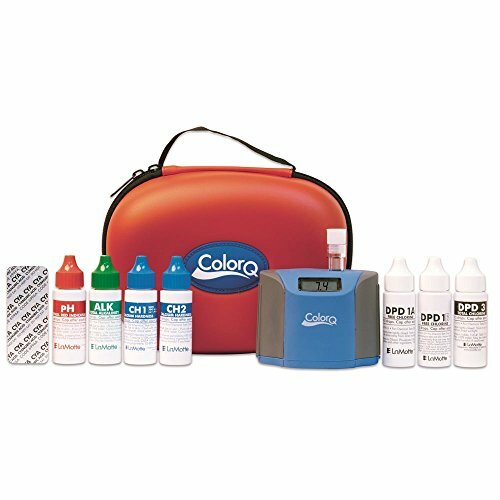 High pH or low alkalinity will especially inhibit pool shock. 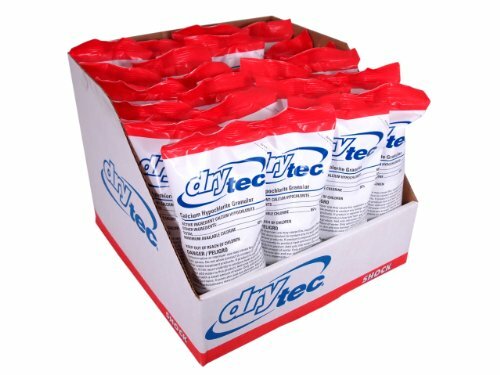 You’ll need calcium hypochlorite shock If you click this link and make a purchase, we earn a commission at no additional cost to you. —and lots of it. Follow the package instructions to determine the dose for your pool size, then multiply that by two, three, or four depending on which type of algae you’ve got. 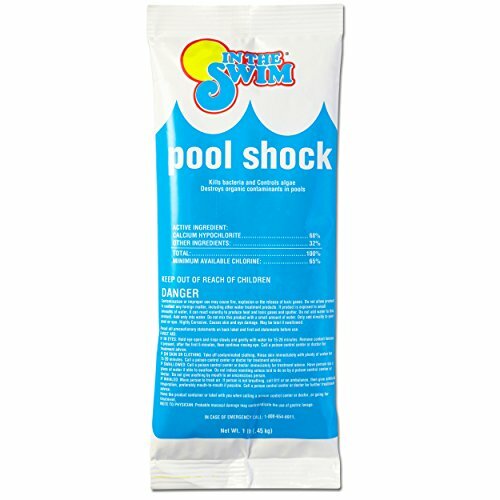 Don’t use stabilized chlorine to shock your pool. You’ll end up with too much cyanuric acid, which inhibits sanitizer, and can lead you right back to algae in your pool, or other, worse problems. Tip: Put your cleaning equipment in the shallow end while you shock your pool so your tools will also be sanitized. When your shock treatment kills the algae, it’ll turn your water a cloudy blue. Run your filter continuously for a minimum of eight hours until the water clears up. You may add pool water clarifier If you click this link and make a purchase, we earn a commission at no additional cost to you. to speed up the process. Be sure to check whether you need to top off your water before turning on the pump. 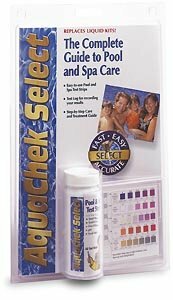 You may use your usual test methods or run a water sample to your local pool store for analysis. You want to be sure your water chemistry is balanced and your chlorine level is back to normal before anyone gets back into the water. If you catch algae in your pool early on, you could use flocculant If you click this link and make a purchase, we earn a commission at no additional cost to you. (also called floc) to save yourself some elbow grease. This additive bonds to floating algae particles, making it easier to vacuum them out of your pool. If you have anything more serious than a mild green algae problem, we recommend you follow the full cleaning plan. 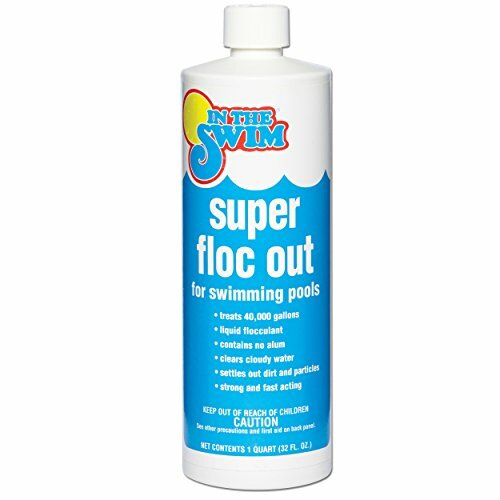 For getting rid of a little green algae quickly, go ahead and get it the floc outta there. If you have a multi-port valve on your filter, shut off your pump and turn the valve to Recirculate or Recycle. This will mix the floc around without filtering the water. 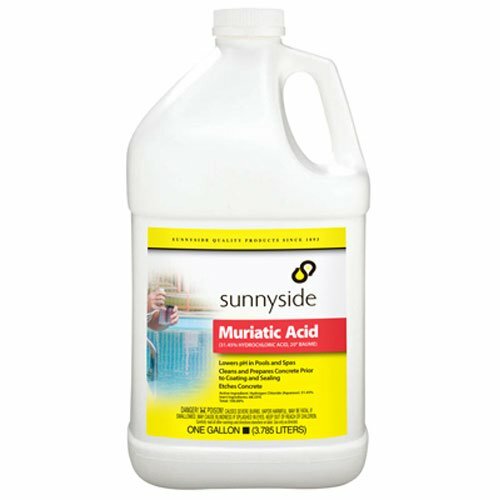 Add the recommended dosage of liquid or powder flocculant to your pool. Circulate your water for two hours, then shut off your pump and let it sit overnight. The floc will bind to the algae, then settle on the pool floor. Turn the multi-port valve set to Waste so dirty water doesn’t blast back into your pool through your return lines. Hook up your backwash hose to the Backwash/Waste port. Direct your waste water appropriately. Vacuum your pool. Work slowly to make sure you get all the thick sediment off the bottom. If the water gets too cloudy, you may need to stop and allow the particles to settle again before continuing to vacuum. Add water while you’re vacuuming because you’ll be removing quite a lot. Double shock immediately after vacuuming to eliminate any remaining algae. You may also want to brush the pool sides and floor before shocking. Run your filter until the water clears. You may be wondering why we haven’t told you to use algaecide If you click this link and make a purchase, we earn a commission at no additional cost to you. to get rid of the algae in your pool. Even though it can kill algae, the product is much more effective as a preventive measure. After cleaning and shocking your pool, wait for the chlorine to fall below five parts per million, then add a dose of algaecide. Brush your pool to loosen any last bits of algae you can’t see. The algaecide will kill it so it can be filtered out. Keeping up with the basics will also go a long way toward preventing algae. Maintain balanced pool chemistry, run your pump 8 to 12 hours per day, and shock regularly. Before allowing pool equipment, floats, and toys into your pool, make sure you’ve thoroughly cleaned them. 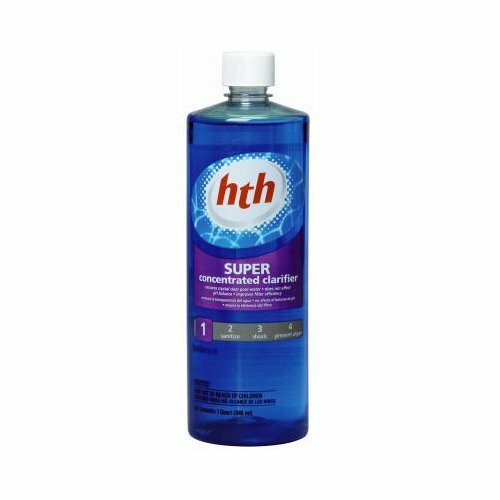 A chlorine-based cleaner If you click this link and make a purchase, we earn a commission at no additional cost to you. 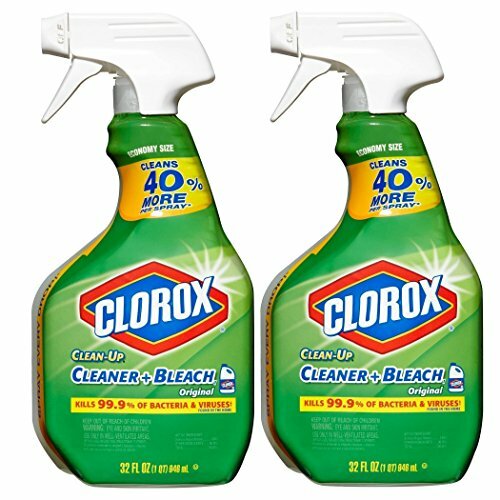 or a solution of one tablespoon of bleach If you click this link and make a purchase, we earn a commission at no additional cost to you. per gallon of water will not only clean, but sanitize them. Just as pool accessories can introduce algae, so can swimsuits—especially if they’ve been worn in the ocean. Be sure to wash—not just rinse—your swimwear before wearing it into your pool. If your older concrete pool surface needs resurfacing, don’t wait. Etched, cracked surfaces make perfect hiding places for algae. They’re shady and almost impossible to clean. Resurfacing cures this issue. Are you wondering how to remove algae from a salt water pool? The process is exactly the same as for a chlorinated pool. Just remember to use calcium hypochlorite shock If you click this link and make a purchase, we earn a commission at no additional cost to you. . Even if you’re on top of your pool water chemistry and regular maintenance, you may still wind up with algae. High humidity and wind are just two examples of contributing factors you couldn’t control even if you tried. But it’s important to act as soon as you notice algae in the pool because it can grow rapidly, becoming tougher to eradicate with each day it goes unaddressed. If you leave behind even a small number of algae spores after cleaning and shocking, it won’t be long before they bloom again. So act quickly and aggressively to get rid of algae, then make algaecide application a part of your regular water care routine to keep the algae away for good. 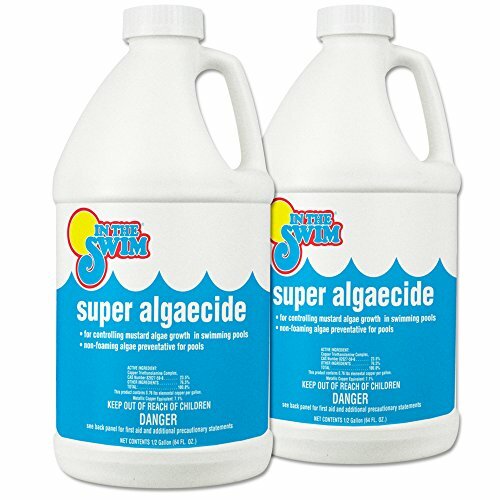 Before you buy algecide, ask yourself: Is it the best way to get rid of algae in your pool? Despite the name, the answer is may not be what you think.